MINNEAPOLIS--(BUSINESS WIRE)-- At the fifth-annual Polaris RZR® UTV World Championship in Laughlin, Nevada, Polaris RZR® Factory Racing continued its winning streak with two wins and six podiums from RZR Factory drivers. Additionally, RZR Factory Racing secured two wins and three total podiums at the SCORE San Felipe 250 series opener in Baja California, Mexico. 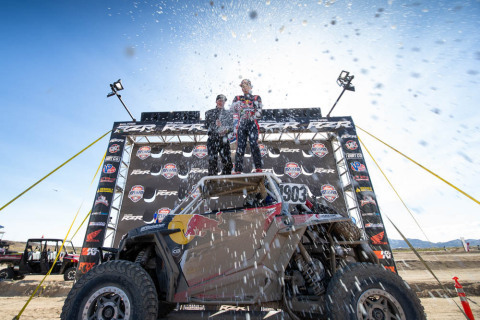 RZR Factory Racing Secures Four Wins and Nine Podiums Across Six Classes - At the UTV World Championship, Polaris RZR Factory Driver Seth Quintero Secured the UTV NA Class Win (Photo: Business Wire).